The Vancouver Condo Buzz » SPECTACULAR Vancouver NAVIO at The Creek Condos & Townhomes next to a 2.7 acre park! A Vancouver Exclusive! The False Creek Vancouver NAVIO condo project emerges at The Creek master planned waterfront community. Located in Vancouver’s newest and most desirable waterfront neighbourhood and overlooking a 2.7 acre park on the False Creek’s celebrated Seawall, NAVIO Vancouver condos features two boutique residential buildings offering 177 homes for sale. In addition, there are 18 distinct townhouses at NAVIO at the Creek Vancouver, which present a rare opportunity for those seeking more space and multi-living residences. Combined with spacious open floor plans, sophisticated finishes and dramatic balconies sized for entertaining year round, the False Creek NAVIO condos is the envy of Vancouver. This is the area’s largest collection of Vancouver Parkside Homes over 900 square feet in living space and priced from the mid $900’s. 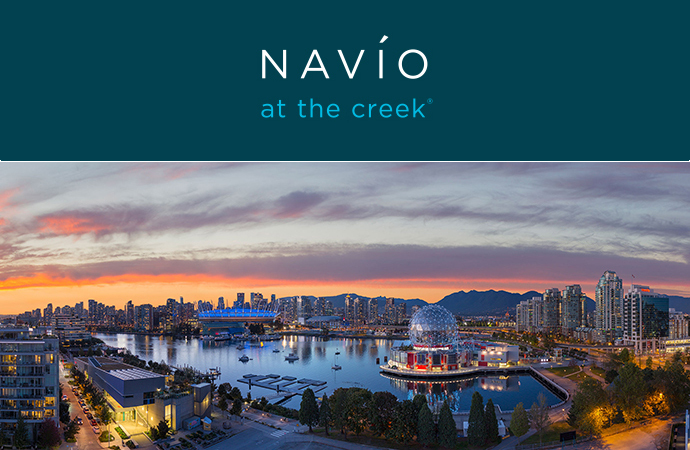 Following the highly successful Voda at the Creek, Concert Properties is pleased to announce that the NAVIO presale condos will start in the summer of 2016. This is Phase 2 of The Creek by Concert master planned False Creek waterfront condo community where you are just steps from the seawall, the world’s longest uninterrupted waterfront path and a very tranquil route into downtown. The spacious interiors and exterior living spaces will provide ample room for you to grow with the largest selection of homes well over nine hundred square feet. If you would like more details, please visit www.thecreekbyconcert.com or you can simply register on this page for representation and for all the information as it becomes released during presales. 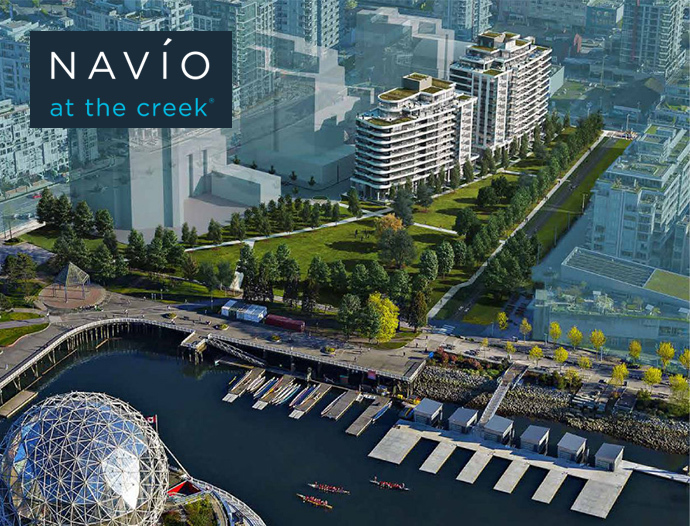 From the NAVIO condo marketing: NAVÍO at The Creek is the envy of Vancouver. Available this summer, NAVÍO represents a rare opportunity to live Parkside and on the Seawall. Composed of two boutique buildings, NAVÍO South contains 107 homes while NAVÍO North has 70. False Creek’s largest selection of Parkside Homes over 900 square feet, from the mid $900s. NAVÍO’s dramatic sweeping balcony and façade expressions emulate the grand proportions of an ocean liner. Together the buildings create a gentle curve following the shape of the expansive 2.7-acre park that is NAVÍO’s front yard. At the heart of The Creek lies a peaceful, central courtyard NAVÍO overlooks – featuring a lush landscape, water feature and plaza. The opportunity to preview your home at NAVÍO is coming next month. As a registrant, we look forward to sharing details with you soon – including renderings, floor plans and virtual tours. The site address is expected to be 95 East 1st Avenue Vancouver. The first phase at The Creek, Voda, is sold out. Vancouver NAVIO condos represents the second phase at this master planned community along a 2.7 acre waterfront park. The project is brought to the market by Concert Properties.